Trust- it’s what it takes to grow. I experienced a threshold in Jiu Jitsu last week. I was promoted to blue belt. It was an emotional experience for me. A friend who practices Jiu Jitsu congratulated me and remembered wondering to himself as he was promoted, “I’m a grown man. Why does this mean so much?” I totally understood what he was saying. 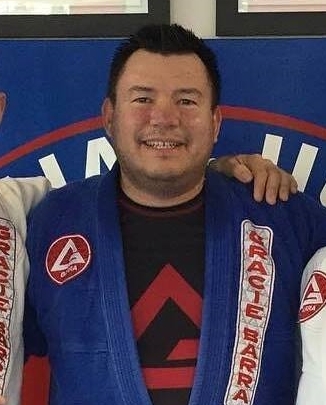 It didn’t change me magically into a better Jiu Jitsu player, but it represented 14 months of hard work, mental and physical challenges, overcoming time constraints, injuries and wholehearted support and encouragement from my family. Gratitude has been a theme for me as I have started on this BJJ journey. I felt that again during the promotion. It was a marker along the way that I can look at and remember this is a real experience that is transforming me. I am a stronger individual for doing this sport. And that strength has made me a better friend, a better husband, a better dad, a better pastor, and a better addition to the groups I’m a part of. For that I am grateful. I am also grateful for Gracie Barra Princeton. Michael Leonardi is an entrepreneur who has been captivated by the social power of Brazilian Jiu Jitsu. He is a purple belt under Professor Ricardo Almeida and the director of GB Princeton and now GB North Princeton. Trust is a powerful thing. I am not naturally good at trust. I have a complex history with trust and I don’t go gently into it. That being said, I am more capable of trust today than I was before I started practicing BJJ. I trust myself more because I have risen to a challenge. BJJ is hard. And I have not given into the temptation to quit when it has gotten tough. It takes time and it takes will. It takes a tolerance for pain. It also takes having a sober judgment of who I am. How fit I am and how tall the mountain I have to climb is. My growing self trust has positively influenced my ability to trust others. I trust my coaches as they have invested hundreds of hours into my growth as a Jiu Jitsu practitioner. And I trust my training partners. That’s not to say they are perfect, just as I am not a perfect training partner. Just last week my toughest partner and I rolled together in live training. I was exhausted and he could tell. So he told me to just use technique to escape or challenge the position I was in. We rolled for 6 minutes this way and it was really beneficial to my game. It took restraint, empathy, and humility on his part. He could have easily crushed me. But he didn’t. He nurtured my Jiu Jitsu game. And we both grew. I am so grateful to training partners like this. And I am grateful for a culture that facilitates humble training. Constant challenge and a consistent and earnest response to it, creates character and culture. I am fully immersed in this now as a way of life. It flows over into all the facets of my life. My faith has grown as I have discovered new ways to trust. I understand the flat sides of my faith and areas when I have been reluctant to surrender to God and to others. Now I practice surrender 2-4 times a week and I’m getting better. I think about what it means to say I tap. I tap to my own selfish will. I tap to my own desires for comfort. I tap to the things that do not lend to my or others flourishing. In the space that this surrender creates is the room for growth. And gratitude. And loyalty. And character. And humility. And grace. Blue belt. Simple. Yet significant! !